If you are searching for some latest, branded yet affordable smartphone from Samsung then Galaxy J7 Nxt could be the best option for you. Galaxy J7 Nxt comes with sophisticated features with 5.5-inch HD display and advanced operating system Android Nougat 7. This July Samsung launched its Galaxy J7 Nxt under its J-series in India. Samsung is one of the most trusted and renowned brands, its smartphones are worthy and come with great quality features, and Galaxy J7 Nxt is no different from any other Samsung smartphones. 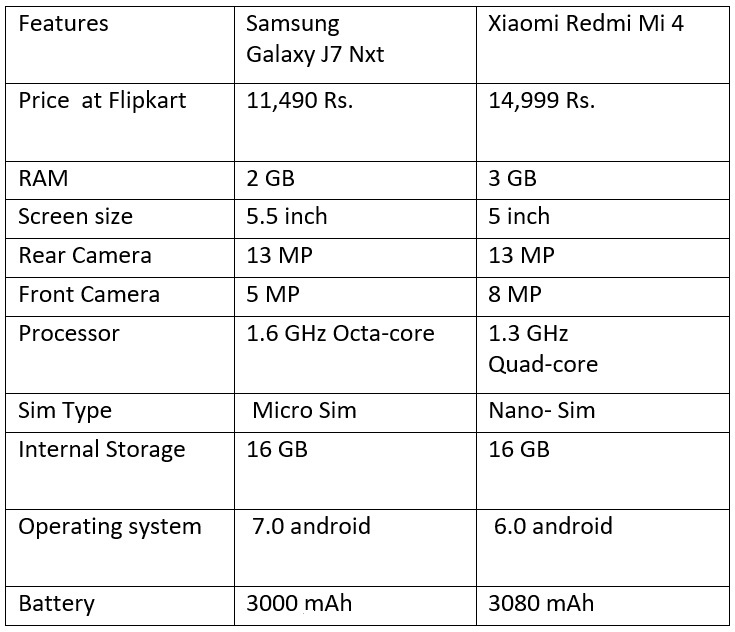 Following you can also find a quick comparison chart between Galaxy J7 Nxt and Xiaomi Redmi Mi 4 by considering various features. Samsung Galaxy J7 Nxt is quite affordable with MRP of Rs 11,490 at the online store Flipkart. Additionally, with current flipkart mobile offers you can avail extra 5% off on your purchase. For this, you need to purchase the mobile via Axis bank buzz credit cards. Also, under the exchange offer policy, one can get up to Rs 10,500 off in-lieu of your existing smartphone, only at Flipkart. Although, the smartphone is available on various online stores and offline as well. So, you can choose the best place to shop it, depending on your needs. • Great Display providing good interface experience. The Display is Super AMOLED type which helps in saving battery as consumes less energy. The 5.5-inch Display makes it quite comfortable to use it for reading, browsing, chatting and much more. Galaxy j7 Nxt has very smooth performance due to its Octa –processor and does not lag while using multiple apps and gives Fluid experience. There are no heating issues while high-intensity gaming. Overall performance is noteworthy. Very Few smartphones have this specification, this operating system is latest and it provides functionalities like the ability to display multiple apps on-screen at once in split screen view. Galaxy j7 nxt has android 7.0 android nougat, which is a notable feature. Today’s generation uses Camera on daily basis to capture moments and share it with the world so, good camera quality is a vital prerequisite before buying the phone. Galaxy j7 Nxt has 13 MP rear camera with rear flash and 5 MP front camera which clicks great selfies. The Samsung Galaxy J7 Nxt has only 2GB of RAM hence, multitasking experience is a little bit hampered for general use it has no issues. The Samsung Galaxy j7 Nxt has limited memory storage making users buy a new memory card to expand memory. 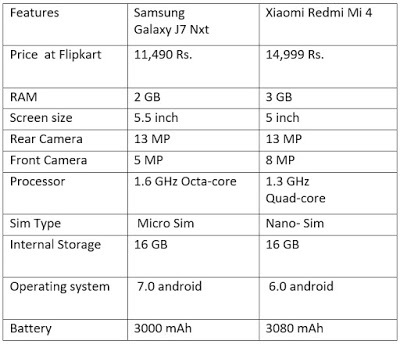 Now, let’s check what critics from Economic times and Gadgets360 are saying about this smartphone. 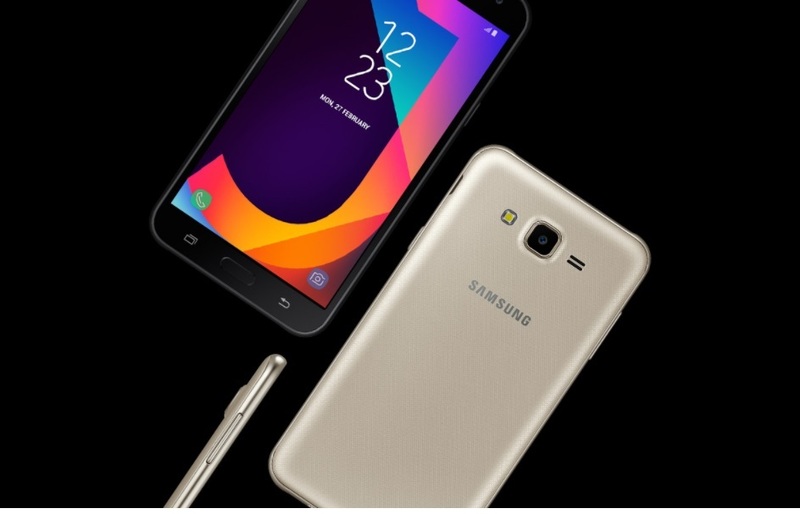 • Gadgets360, which is an NDTV venture says the highlights of Samsung Galaxy J7 are Android Nougat operating system, HD Super AMOLED display and Resolution of 720 pixels by 1280 pixels. As Samsung galaxy j7 Nxt is new in the market there are not much user reviews as many reviews given by user are all positive. • Economic times reviews it as It is a mid-end phone catering to masses. The device design is similar to Galaxy’s popular J series with removable plastic cover. Galaxy j7 Nxt is a newly launched smartphone with advanced features. The looks are quite trendy similar to other J series smartphones. The Performance is good and strong features lineup and fast functioning you will rarely find any bumps. Galaxy J7 Nxt is really an eye catcher and fine performer smartphone.